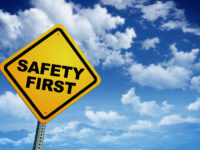 Always be aware of the risks related to heavy equipment, other vehicles, and traffic flow. To avoid collisions, do not speed around other vehicles or move into their blind spot. When in your vehicle, be cautious of pedestrians on the site. When outside of your vehicle, be aware of other vehicles moving around the facility. Never scavenge in the waste for reusable items. In addition to sharp and heavy objects, municipal solid waste can include rotting organic material that can spread bacterial infections. While medical waste and household hazardous waste should not be included with trash or recyclables, mistakes are sometimes made. There may be medical sharps or toxic, caustic, or flammable liquids mixed in with any pile at the site. Prepare before you go. A variety of people use these facilities: collection haulers, community members like you in a personal vehicle, or contractors with construction and demolition debris. If you are entering the facility for the first time, a little preparation can make the process go smoothly and safely for you and everyone else on site. Before you go, you will probably check the facility website or Facebook business page for hours of operation and accepted materials. While you are at the website, look for a facility map and any safety guidance that might be provided. Most facilities prohibit scavenging, smoking, and speeding. As you enter the site, look for signs that communicate directional and safety guidance. Ask gatehouse staff or other workers on site about customer safety policies as you enter the property. While you are at the facility, avoid distractions like texting, talking on the phone, adjusting your entertainment system, or programming your GPS. Take responsibility for your own safety. In order to protect yourself and your vehicle, you have to be willing to be a partner in the process. For more on safety on the streets when you see a solid waste or recycling vehicle, read Slow down to get around!